"Although most Canadians are familiar with surveillance cameras and airport security, relatively few are aware of the extent to which the potential for surveillance is now embedded in virtually every aspect of our lives. We cannot walk down a city street, register for a class, pay with a credit card, hop on an airplane, or make a telephone call without data being captured and processed. Where does such information go? Who makes use of it, and for what purpose? Is the loss of control over our personal information merely the price we pay for using social media and other forms of electronic communication, or should we be wary of systems that make us visible—and thus vulnerable—to others as never before? 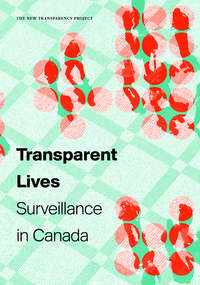 The work of a multidisciplinary research team, Transparent Lives explains why and how surveillance is expanding—mostly unchecked—into every facet of our lives. Through an investigation of the major ways in which both government and private sector organizations gather, monitor, analyze, and share information about ordinary citizens, the volume identifies nine key trends in the processing of personal data that together raise urgent questions of privacy and social justice. Intended not only to inform but to make a difference, the volume is deliberately aimed at a broad audience, including legislators and policymakers, journalists, civil liberties groups, educators, and, above all, the reading public."